Organic whole wheat flour, organic soy milk (filtered water and organic soybeans), organic carob powder, organic vanilla extract, organic coconut oil. Carob contains vitamin B1, niacin, and vitamin A. It’s also high in vitamin B2, calcium, magnesium, and iron. 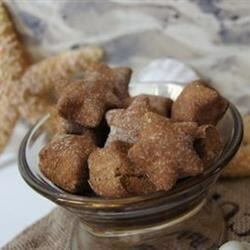 So next time you’re sitting on the couch treating yourself to some tasty chocolate, don’t forget about your canine companion, throw a little Carob his way – you can indulge together. Whole Grains such as wheat are rich in dietary fiber, antioxidants, protein, dietary minerals (including magnesium, manganese, phosphorus, and selenium) and vitamins (including niacin, vitamin B6, and vitamin E). Canola Oil is a unique ratio of almost 2-to-1 Omega-6 to Omega-3 makes it the richest vegetable oil source of essential fatty acids By giving canola oil to your canines, you can help to increase their circulation, reduce joint tenderness, and maintain their healthy immune system. Plus, it’s great for maintaining healthy skin and coat.